A Sales Porter is hired in various industries, but the role of a sales porter is of great importance mainly in automotive companies. The job description purpose of a sales porter in this industry is to move and clean the vehicles and also maintain the working condition of the vehicle. 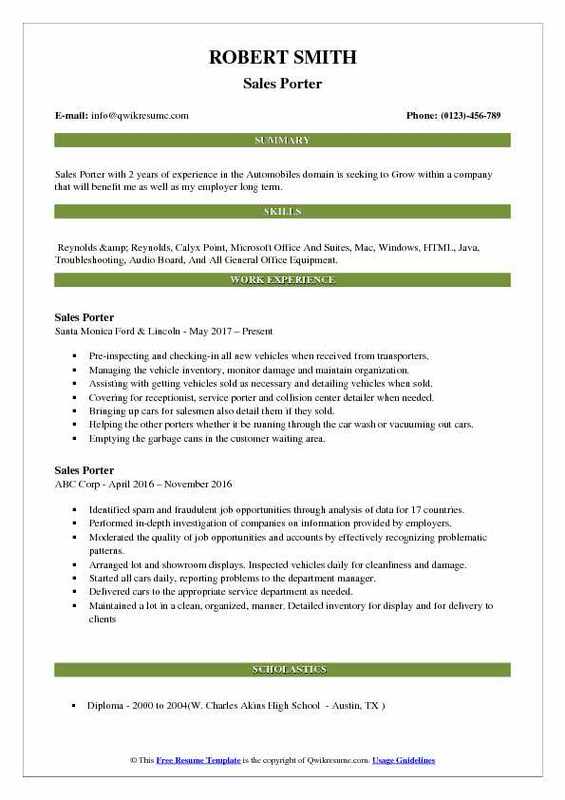 The other major tasks listed in the Sales Porter resume are – maintaining new and used vehicles in good appearance condition, performing cleaning and replenishing activities, placing manuals, stock tags and guides in the vehicle, moving the vehicle to display location, making key tags and performing all other tasks as assigned. To perform the task of a porter, the candidate should possess necessary skills such as excellent driving skills including parking, removing the vehicle in narrow areas and the ability to frequently move vehicles as required, physical capacities and a valid driving license. Even though these porters do not need any formal education, the resume should mention the capabilities to pass pre-employment tests that may include background checks, credit report, and MVR test. 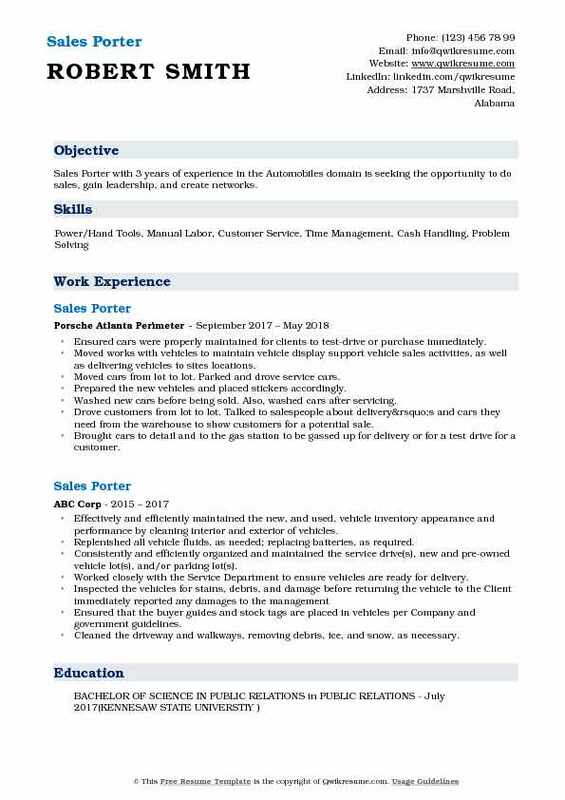 Objective : Talented and dependable Sales Porter with 4 plus years of experience who can take on challenges surpass them I am seeking employment in your company where I can use my skills and talents to grow and expand the company I want to excel because of my perseverance, dedication and hard work. Doing inventory daily on the pre-owned vehicles to make sure all of them are updated in our system. Receiving the incoming vehicle and sign off on it and check for any damages while the vehicle was being transported. Greeting the customers wandering the lot looking for cars and match them with an available salesperson. Organizing the vehicles in the lot and making sure they are organized and parked neatly. Maintaining decals on used cars, buyers guides/not for sale tags on cars and current sale tags in cars. Maintaining the battery charging process and battery charging log to properly ensure batteries are charged at all times. Driving dealer trades, delivering cars to customers and shuttling cars as needed. Modeling the values and guiding principles of the dealership, greeting and assisting the customers when they enter the service area. Operating the company vehicles with, and without, the trailer. Headline : Experienced Sales Porter bringing enthusiasm, dedication and an exceptional work ethic. High energy and outgoing with a dedication to positive guest relations. High volume dining, customer service, and cash handling background. Checking the specifications of materials loaded or unloaded against information contained in work. Informing the designated employees or departments of items loaded or problems encountered. Presenting the bills and receipts and collect payments for goods delivered or loaded. Computing the sales prices, total purchases and receive and process cash or credit payment. Receiving and processing the inventory in the high jump platform software system and helping monitor the store's inventory. Managing, packaging, and shipping out the store's damages and returns. Assisting any and all sales personnel with their sales through lifting and transporting furniture and entertainment systems. Helping test equipment and inspect that everything works. Helping pick up heavy apparatuses. 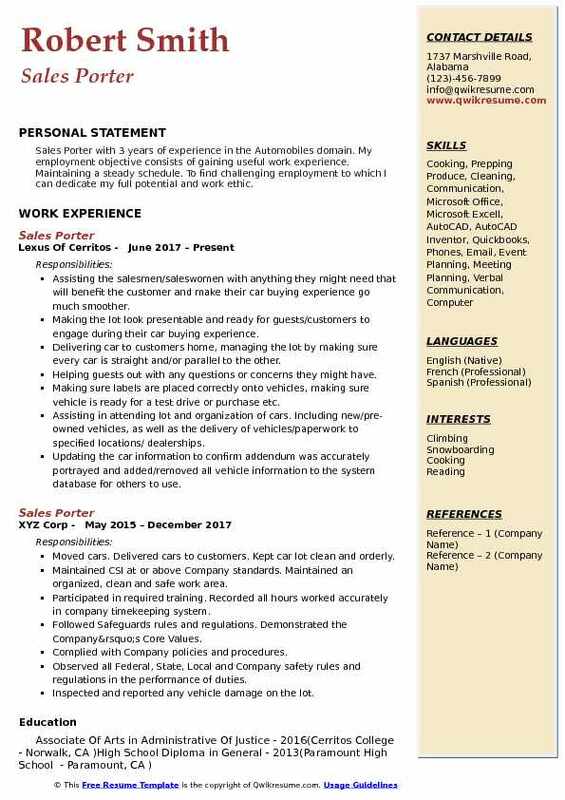 Objective : Sales Porter with 2 years of experience in the Automobiles domain is seeking to Grow within a company that will benefit me as well as my employer long term. Skills : Reynolds & Reynolds, Calyx Point, Microsoft Office And Suites, Mac, Windows, HTML, Java, Troubleshooting, Audio Board, And All General Office Equipment. Pre-inspecting and checking-in all new vehicles when received from transporters. Managing the vehicle inventory, monitor damage and maintain organization. Assisting with getting vehicles sold as necessary and detailing vehicles when sold. 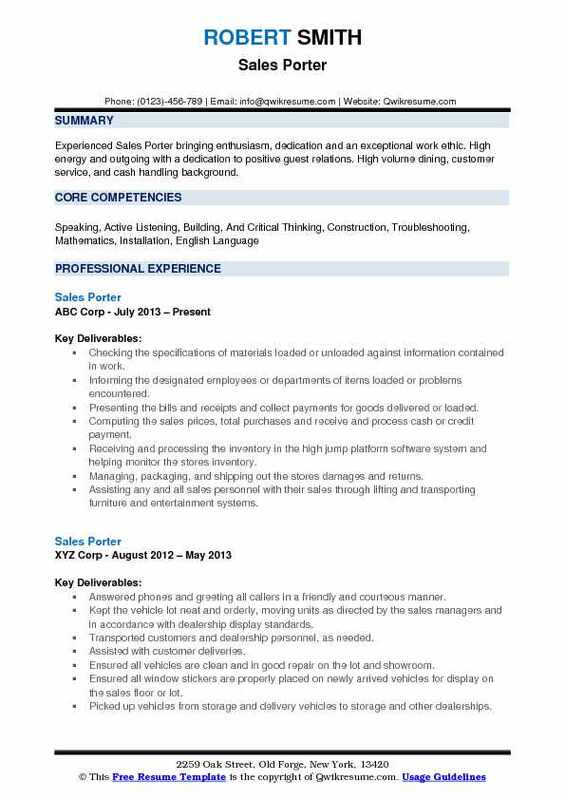 Covering for receptionist, service porter and collision center detailer when needed. Bringing up cars for salesmen also detail them if they sold. Helping the other porters whether it be running through the car wash or vacuuming out cars. Emptying the garbage cans in the customer waiting area. Checking in new cars when they came to the dealership parking them in the storage lot and bringing the keys to the manager upstairs. My closing duties were to make sure every car was locked put away in the right spot. Making sure all keys are returned to the kiosk and wait for any sale to finish before leaving. Objective : Highly motivated Sales Porter with 3 years of experience and with a proven ability to learn quickly, create, implement, and maintain procedures both old and new in any environment. Keeping the vehicles on lot neat and orderly, moving units as directed by the sales managers and in accordance with dealership display standards. Ensuring all window stickers are properly placed on newly arrived vehicles for display on the sales floor or lot. Communicating with vendors regarding back order availability, future inventory and special orders. Preparing the cars for delivery, checking inventory, greeting and guiding customers in the right direction, list sales on the website, wash, gas, and detail cars, bring in new cars and prepare for sales. Preparing merchandise to be sold, taking the vehicle to be detailed such as car wash, fill gas, and oil if needed and other general maintenance before displaying for customers to purchase and taking for a test drive. Maintaining and stocks key machine, locating and accounts for inventory, securing the vehicles and company property daily. Objective : Patient and empathetic Sales Porter with 3 plus years of experience in the Automobiles domain with an extensive background in conflict resolution, detail oriented situations, and customer/product care. Driving new cars from various lots around Los Angeles while maintaining a professional and safe attitude. Recipient of multiple positive reviews acknowledging dedication and efficiency. Making sure all vehicles are in running condition (no dead batteries/gas tank filled). Maintaining the customer parking spots clear of any stock unit vehicles that are not being worked on. Displaying the knowledge of current inventory, delivering vehicles to clients off-site, retrieve vehicles at neighboring Mercedes locations, stock vehicle tags into the system. Assisting the salesmen however necessary, running clerical errands for staff, cleaning and preparing the vehicles for clients after they are sold. Maintaining the parking lot cleanliness and order, maintaining a professional appearance at all times. Directing and assisting the clients when they are surveying the dealership. 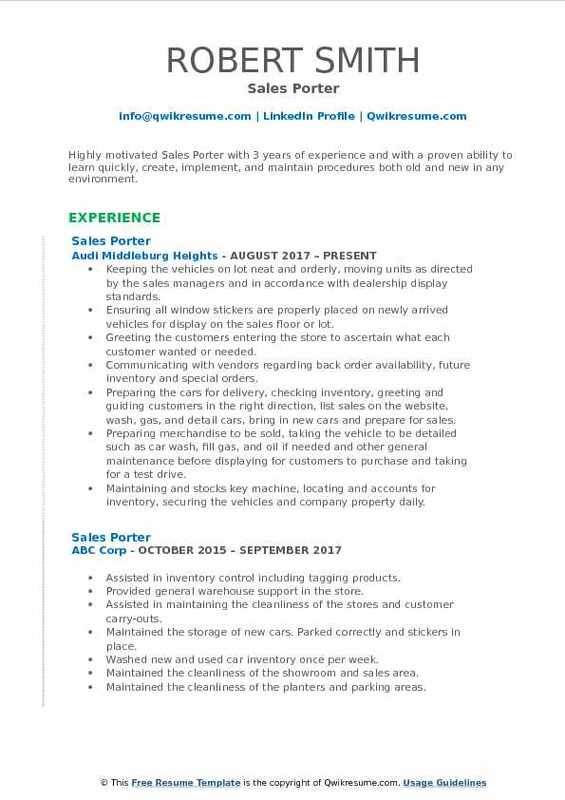 Objective : Sales Porter with 3 years of experience in the Automobiles domain is seeking the opportunity to do sales, gain leadership, and create networks. Ensured cars were properly maintained for clients to test-drive or purchase immediately. Moved works with vehicles to maintain vehicle display support vehicle sales activities, as well as delivering vehicles to sites locations. Moved cars from lot to lot. Parked and drove service cars. Prepared the new vehicles and placed stickers accordingly. Washed new cars before being sold. Also, washed cars after servicing. Drove customers from lot to lot. Talked to salespeople about delivery’s and cars they need from the warehouse to show customers for a potential sale. Brought cars to detail and to the gas station to be gassed up for delivery or for a test drive for a customer. Kept the lot organized as in making sure the test driveline includes all models and all vehicles have plate frames and inserts occasionally go on test drives with customers do customer car drop-offs at their houses. 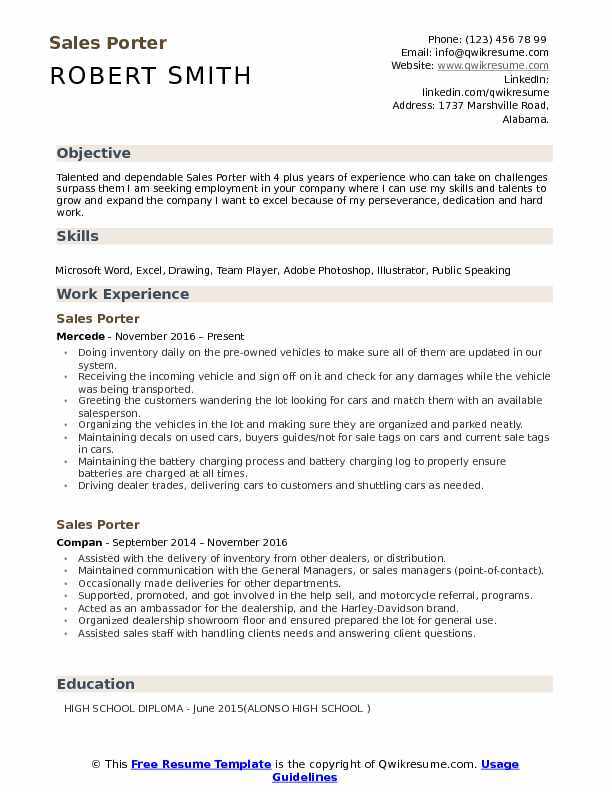 Headline : Resourceful, reliable Sales Porter with 5 years of experience in the Automobiles domain who consistently meets and exceeds productivity goals with proven capacity to troubleshoot and resolve issues quickly. Maintains a high standard of quality with great attention to detail along with a high level of professionalism, patience, and efficiency. Responsible for the intake of new and dealer-traded inventory and upkeep of new and used car lots. Included the organization, monthly inventory, making deal jackets for spare keys of incoming vehicles. 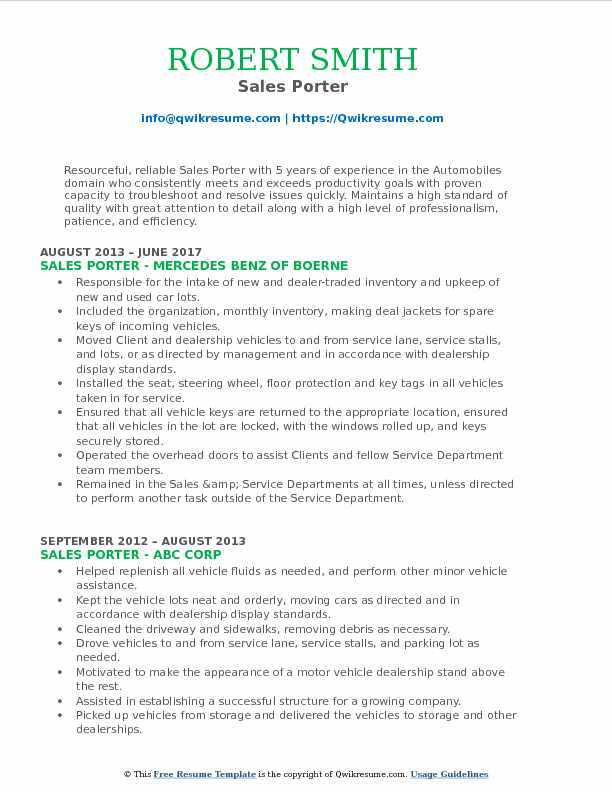 Moved Client and dealership vehicles to and from service lane, service stalls, and lots, or as directed by management and in accordance with dealership display standards. Installed the seat, steering wheel, floor protection and key tags in all vehicles taken in for service. Ensured that all vehicle keys are returned to the appropriate location, ensured that all vehicles in the lot are locked, with the windows rolled up, and keys securely stored. Operated the overhead doors to assist Clients and fellow Service Department team members. Remained in the Sales & Service Departments at all times, unless directed to perform another task outside of the Service Department. Actively sought out additional assignments during non-peak time frames. 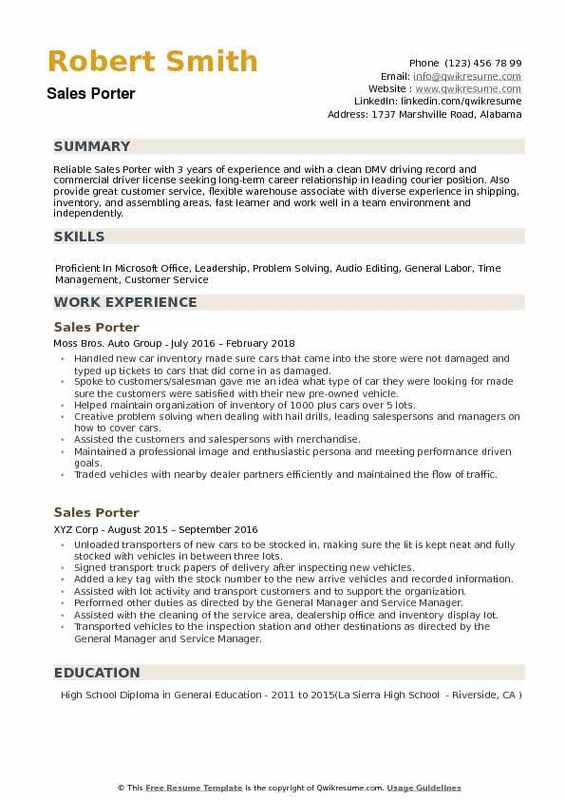 Objective : Sales Porter with 3 years of experience in the Automobiles domain with an objective to enhance my leadership and customer service skills, and to provide a positive work ethic while gaining and achieving the proper skills necessary to properly, safely, and successfully complete the tasks at hand. Drove vehicles to and from the showroom, exterior vehicle display areas, a service department, parking garage or other storage areas to designated location as needed. Maintain inventory and assist customers and other dealership employees in the retrieval of vehicles. Ensured all required documentation is placed in vehicles, including but not limited to window stickers, manuals, promotional materials. Created key tags for vehicles, organized and maintained the keys for new, used and loaner vehicles. Delivered keys and other materials to various departments on request. Met and exceeded sales goals and achieved incentive compensation every quarter. Assisted in setting vehicles on the sales floor as per display standards and maintained key tags for each vehicle. 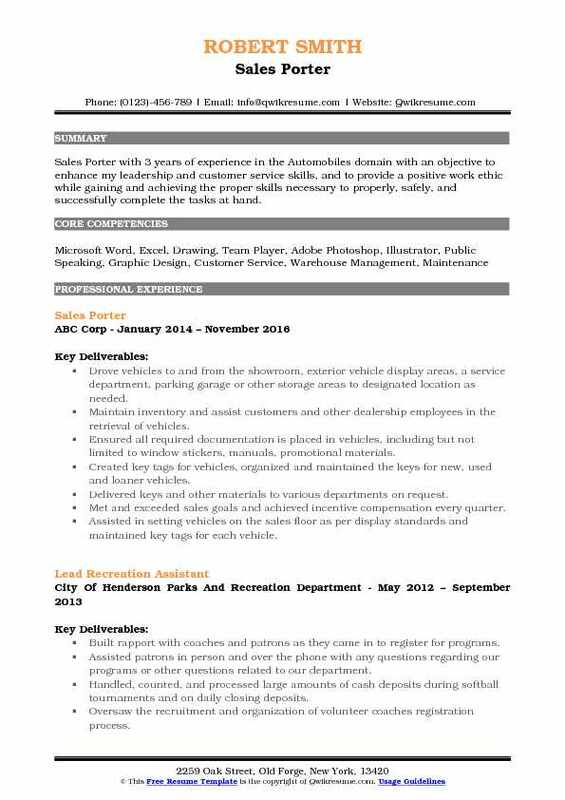 Objective : Sales Porter with 3 years of experience in the Automobiles domain. My employment objective consists of gaining useful work experience. Maintaining a steady schedule. To find challenging employment to which I can dedicate my full potential and work ethic. Assisting the salesmen/saleswomen with anything they might need that will benefit the customer and make their car buying experience go much smoother. Making the lot look presentable and ready for guests/customers to engage during their car buying experience. Delivering car to customers home, managing the lot by making sure every car is straight and/or parallel to the other. Helping guests out with any questions or concerns they might have. Making sure labels are placed correctly onto vehicles, making sure vehicle is ready for a test drive or purchase etc. Assisting in attending lot and organization of cars. Including new/pre-owned vehicles, as well as the delivery of vehicles/paperwork to specified locations/ dealerships. Updating the car information to confirm addendum was accurately portrayed and added/removed all vehicle information to the system database for others to use. 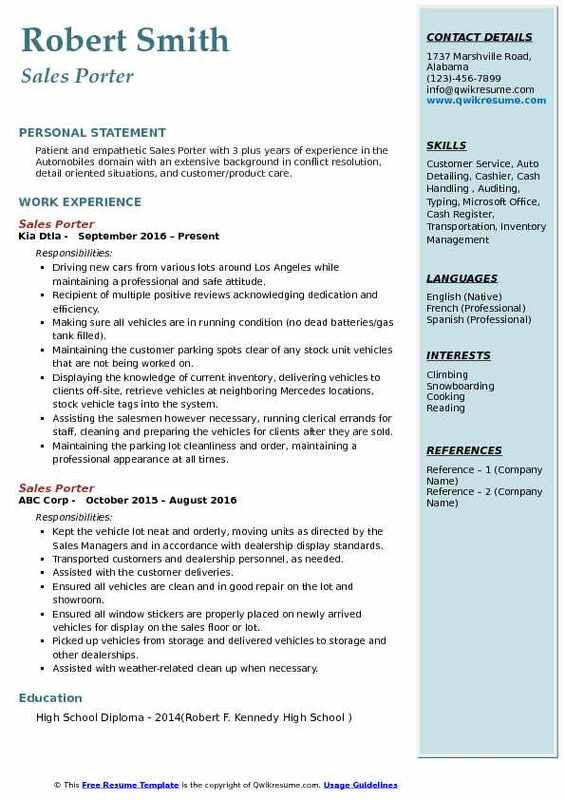 Objective : Reliable Sales Porter with 3 years of experience and with a clean DMV driving record and commercial driver license seeking long-term career relationship in leading courier position. Also provide great customer service, flexible warehouse associate with diverse experience in shipping, inventory, and assembling areas, fast learner and work well in a team environment and independently. Handled new car inventory made sure cars that came into the store were not damaged and typed up tickets to cars that did come in as damaged. Spoke to customers/salesman gave me an idea what type of car they were looking for made sure the customers were satisfied with their new pre-owned vehicle. Helped maintain organization of inventory of 1000 plus cars over 5 lots. Creative problem solving when dealing with hail drills, leading salespersons and managers on how to cover cars. Assisted the customers and salespersons with merchandise. Maintained a professional image and enthusiastic persona and meeting performance driven goals. Traded vehicles with nearby dealer partners efficiently and maintained the flow of traffic. Interacted with 50-100 clients daily via telephone and in person and responded efficiently to their concerns or issues. Kept parking lot organized, brought cars up front for test drives, and put them back.